Battlefront just announced the release of a v1.20 demo including contents from the British Forces and Marines modules. 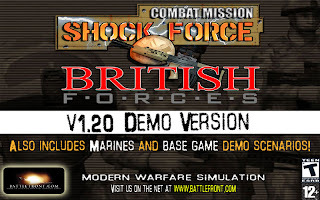 ... the all new v1.20 demo for Combat Mission Shock Force, including British Forces and Marines content, is out now!!! With an additional and completely new British mission, the demo showcases all the new features of the latest v1.20 of the series, includes full multiplayer functionality and a total of 5 (!) missions. As for the British Forces module, the word is that they are working on the installers so the release won't be until the next week.